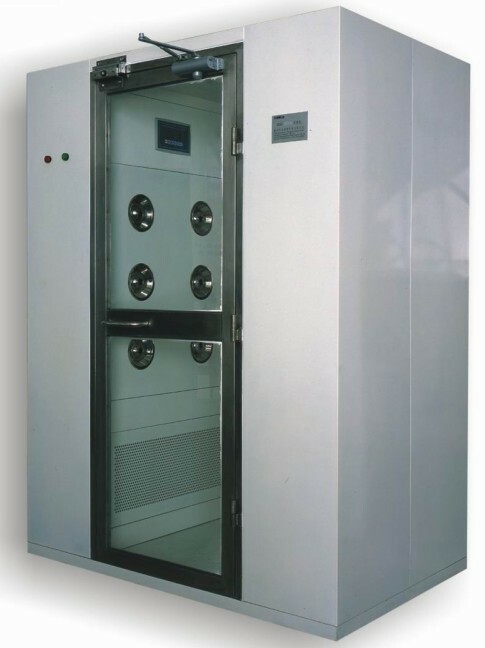 Cleanroom Air Showers are prefabricated enclosures to be used for removing surface particles from personnel prior to entering a Cleanroom work area. The air shower is a high velocity, low pressure type system, providing a normal entrance to and exit from a contamination controlled area. While the workmanship and materials are of a professional quality, the air showers are ultimately engineered to incorporate an aesthetically pleasing design to fit the general atmosphere of the cleanroom specifications. All our Air Showers are assembled and tested directly in the factory for quality control purposes, and then subsequently disassembled for shipping and field assembly. Each assembled Air Shower is a completely self contained unit, equipped with air filtration systems, blowers, motors, controls, a solid-state programmable microprocessor, interlocking doors, lighting, and a pre-wired electrical panel. Although we offer a wide and varied array of standard Air Shower design packages, we can also customize these units to meet your special needs. Contact us with your requirements and we will demonstrate our proficiency by designing an Air Shower that will work the way you need it to. Typical configurations include, but are not limited to, straight thru patterns, right turn patterns, left turn patterns, U-shaped patterns and T-shaped patterns. All units are carefully packaged for transportation, and are shipped by recognized carriers at the lowest applicable rate. All our Air Showers are Inspected prior to shipping by factory quality assurance personnel. Units are set up square and plumb on a level surface in the factory test area, and any necessary adjustments to doors and door seals will be made to project satisfaction. Sound levels, velocity, vibration, cleanliness, trueness to size, and integrity of design are checked prior to disassembly and crating. After disassembly for shipment, all components are marked clearly for field installation. A floor plan, assembly instructions, and an electrical schematic are provided for each Air Shower. As always, our professional technical assistance is only a phone call away, before or after completion of any project. Air Shower is available in, SS 304 / SS 316 / SS 316L, CRCA Powder coated. Air Shower is with a variety of standard dimensions.